Hotel Mario is a action puzzle game developed by Fantasy Factory and published by Philips Interactive Media. It was distributed by Nintendo for the Philips CD-i in 1994. After Nintendo decided not to have Philips create an add-on for the SNES, they gave Philips permission to use their characters in games for Philips' CD-i. The games were given little time to be developed and little funding, and Nintendo only gave cursory input. 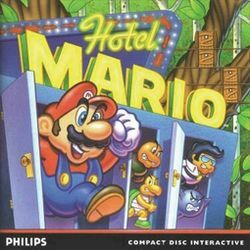 The games resulting from the license were widely criticized, with Hotel Mario being regarded as one of the worst Mario games, due to the animation of the shutting doors, the unresponsive controls and especially known for the cutscenes that used full motion video. The CD-i was considered a commercial failure and the games became valuable due to their rarity. The primary character of the game is Mario, who must find Princess Toadstool by going through seven Koopa hotels in the Mushroom Kingdom. Every hotel is divided into multiple stages, and the objective is to close all doors on each stage. Defeating a Koopaling on the hotel's final stage takes the player to the following building. This page was last edited on 18 October 2013, at 17:39.